142 Beacon is located on the north side of Beacon, between Berkeley and Clarendon, with 140 Beacon to the east and 144 Beacon to the west. 142 Beacon was built ca. 1860, one of a symmetrical pair (140-142 Beacon), with 142 Beacon three feet wider than 140 Beacon. As originally built, the houses had brownstone façades, a shared entrance portico, and a single cornice and mansard roof with two dormers each. They were originally numbered 120 Beacon and 121 Beacon, but re-numbered as 140 Beacon and 142 Beacon ca. 1862 when homes were built on the south side of the street. The land for 140-142 Beacon was acquired by wholesale dry goods merchant Gardner Brewer in three transactions. 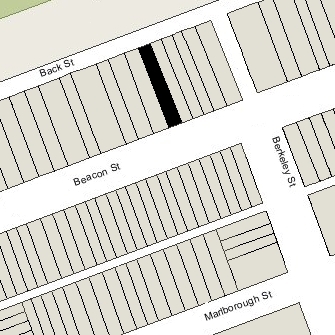 On May 23, 1859, and June 20, 1859, he acquired two 20 foot wide lots from the Boston and Roxbury Mill Corporation, and on August 4, 1859, he acquired an additional three foot wide strip to the west from John A. Blanchard, part of a lot he had purchased on June 20, 1859, from the Boston and Roxbury Mill Corporation. On August 6, 1859, Gardner Brewer sold the western lot, with a 23 foot frontage, to George Washington Wales, who built his home at 142 Beacon. Gardner Brewer built 140 Beacon on the eastern lot, with a 20 foot frontage. Click here for an index to the deeds for 142 Beacon. On March 30, 1861, after the houses were completed, Gardner Brewer and George Wales entered into an agreement limiting the height of any structure in the rear of each other’s property and granting each other “free and uninterrupted easement of light and air” above 17 feet. George Washington Wales and his wife, Maria (Dow) Wales, made 142 Beacon their home. He was a retired shipping merchant. They also maintained a home in Newport. 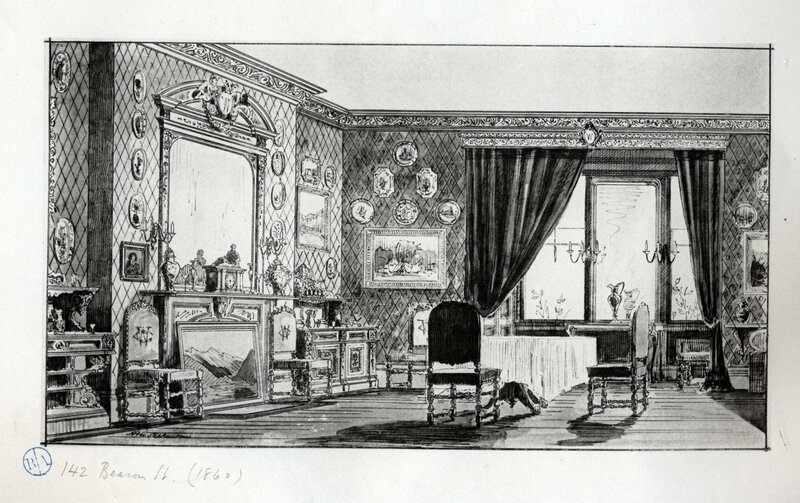 The dining room of 142 Beacon is illustrated and described in The Book of American Interiors, by Charles Wyllys Elliott, published in 1876. It is described as being 20 feet by 25 feet, with oak woodwork. George Wales died in July of 1896. Maria Wales continued to live at 142 Beacon (and at their home in Newport) until her death in September of 1902. 142 Beacon was not listed in the 1903 Blue Book. On April 23/27, 1903, 142 Beacon was purchased from the heirs of George Wales by Mary Helena (Abbott) Sharpsteen Myer, the widow of Clark Lawrence Sharpsteen and of Isaac Myer, Jr. Mary Helena Sharpsteen, her daughter by her first marriage, lived with her. She was an aspiring actress and later would become an author. Mrs. Myer and her daughter previously had lived in New York City. In June of 1903, Mary Myer purchased 140 Beacon, which became the home of her sister, Dr. Helen Cecilia De Silver (Abbott) Michael. She and her husband, Arthur Michael, previously had lived at 35 West Cedar. Dr. Michael also may have operated a clinic for the poor at 140 Beacon. She died in November of 1904. On December 21, 1903, Mary Myer transferred 142 Beacon to her daughter, and on the same day she transferred it to the Van Norden Trust Company as a trustee on her behalf. Mary Helene Sharpsteen married in October of 1905 to Errol Dunbar, an actor. After their marriage, the Dunbars lived at 142 Beacon with her mother. On January 20, 1906, Mary Myer transferred 140 Beacon to James Wright as a trustee. That same month, Mary Helena (Sharpsteen) Dunbar and the Van Norden Trust Company transferred 142 Beacon to James Wright as trustee. On February 21, 1906, James Wright transferred the two properties to William J. Henderson as successor trustee. For the next thirty years, 140 Beacon and 142 Beacon were held by trustees of trusts established by Mary (Abbott) Sharpsteen Myer and Mary Helena (Sharpsteen) Dunbar: William Henderson from 1906 to 1909, Richard Hunter from 1909 to 1916, and the Equitable Trust Company of New York from 1917 to 1935. 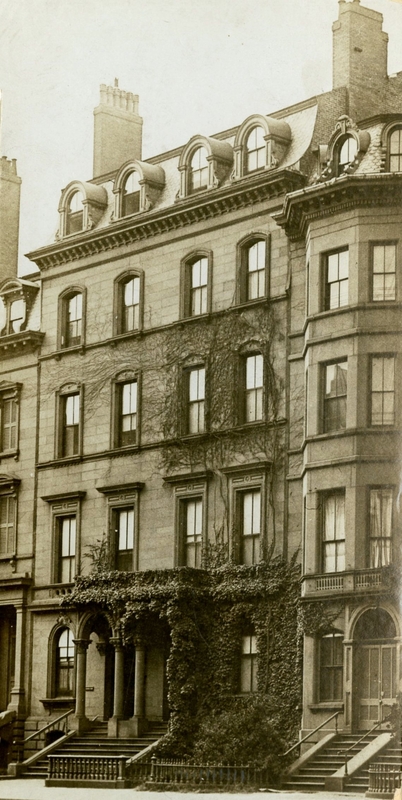 Mary Myer and the Dunbars continued to live at 142 Beacon during the 1906-1907 winter season, but moved soon thereafter to The Ludlow (southwest corner of Clarendon and St. James). They had moved back to New York City by 1910. Their trusts continued to own 140 Beacon and 142 Beacon and lease them to others. 142 Beacon was not listed in the 1908 Blue Book. By the 1908-1909 winter season, 142 Beacon was the home of Charles Henry Bingham, a railroad conductor, and his wife, Elizabeth (Mead) Bingham, who operated it as a lodging house. They previously had lived at 169 Beacon, where they also operated a lodging house. The Binghams moved by the 1910-1911 season and by the next season were living at 324 Commonwealth. 142 Beacon continued as a lodging house. Among the longer-term residents during this period were Gurdon MacKay, a dentist, and his wife, Florence Lydia (Brown), and Dr. George Oliver Clark, a physician. Gurdon and Florence MacKay lived at 142 Beacon from about 1910 through 1917; he maintained his dental office at The Empire at 333 Commonwealth, where he and his wife had moved by the 1917-1918 winter season. George Clark lived at 142 Beacon from about 1910, and also maintained his medical office there. He previously had lived at 84 Commonwealth. He married in October of 1913 to Alice Carnzu Abbot and they moved to an apartment at 295 Commonwealth. He continued to maintain his offices at 142 Beacon and also at 295 Commonwealth in 1918, but by 1920 had moved both his home and office to 67 Marlborough. By January of 1920, the lodging house at 142 Beacon was operated by William W. Taber and his wife, Lena J. (McDonough) Taber. William Taber’s mother, Emeline (Holmes) Taber Quackenbush, lived with them. William Taber died in July of 1920 and Lena Taber moved to Brighton. By 1922, she was living at 302 Commonwealth. By 1923, 140 Beacon and 142 were being operated as a single lodging house. By 1928, the lodging house at 140-142 Beacon was managed by Frederick Samuel Philpott and his wife, Sophia J. (Campbell) Philpott. They previously had lived in Quincy, where they had been a steward and stewardess in a private club; prior to that, they had been the butler and housekeeper for Larz and Isabel (Perkins) Anderson at their homes in Brookline and Washington DC. The Philpotts continued to live and run the lodging house at 140-142 Beacon until about 1934. Neither address was listed in the 1935-1937 Blue Books, and both properties were shown as vacant in the 1935-1936 City Directories. On June 26, 1935, the Massachusetts Hospital Life Insurance Company foreclosed on the mortgage it held on 140 Beacon from Mary H. Myer (who had died in December of 1929), the obligation having been assumed by the Equitable Trust Company. On October 30, 1935, the Columbian National Life Insurance Company foreclosed on the mortgage it held on 142 Beacon from Mary H. Myer, which also had been assumed by the Equitable Trust Company. Thereafter, the two buildings were owned separately. Columbian National Life retained possession of 142 Beacon. 142 Beacon continued to be shown as vacant in the 1937 City Directory. It probably was at that time that the front façade was remodeled (140 Beacon was remodeled in 1936). By 1938, 142 Beacon was occupied as a multiple dwelling. On December 30, 1943, 142 Beacon was acquired from Columbia National Life Insurance by real estate dealer Howard S. Cosgrove, and on December 31, 1943, it was acquired from him by insurance broker and real estate investor Maurice Harry Saval (Morris Savalonski). On January 9, 1995, 142 Beacon was acquired from Beaconside Properties by Lewis A. Sassoon, trustee of the 142 Beacon Street Nominee Trust. On January 6, 2011, he transferred the property to the 142 Beacon Trust, LLC, of which he was manager. On December 3, 2015, the 142 Beacon Trust LLC transferred 142 Beacon to the Boucai Properties LLC (Solomon Boucai, manager) and to the Beacon Street Family Trust LLC ( Lewis Sassoon, manager), each with a 50 percent interest. 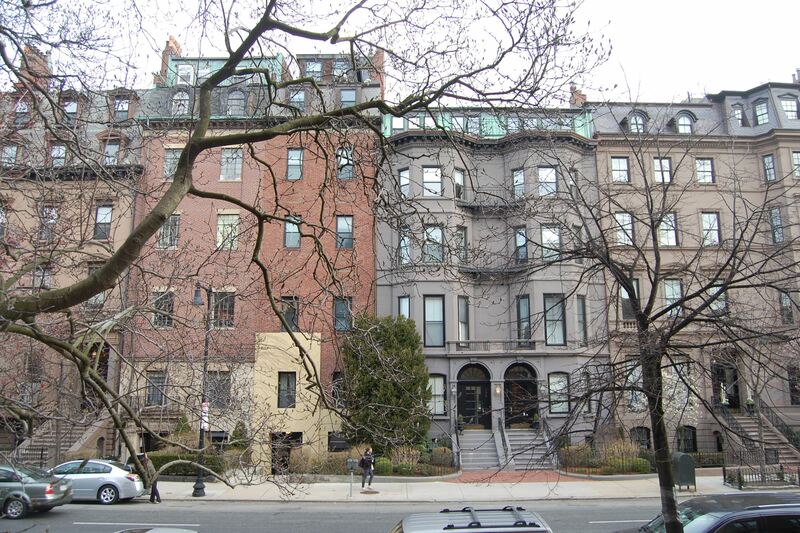 On the same day, Solomon Boucai, trustee of the Beacon 140 Nominee Trust, transferred 140 Beacon to the Boucai Properties LLC and to the Beacon Street Family Trust LLC, each with a 50 percent interest. Also on the same day, the two LLCs entered into an agreement giving each other the right of first refusal if either wished to sell either property. 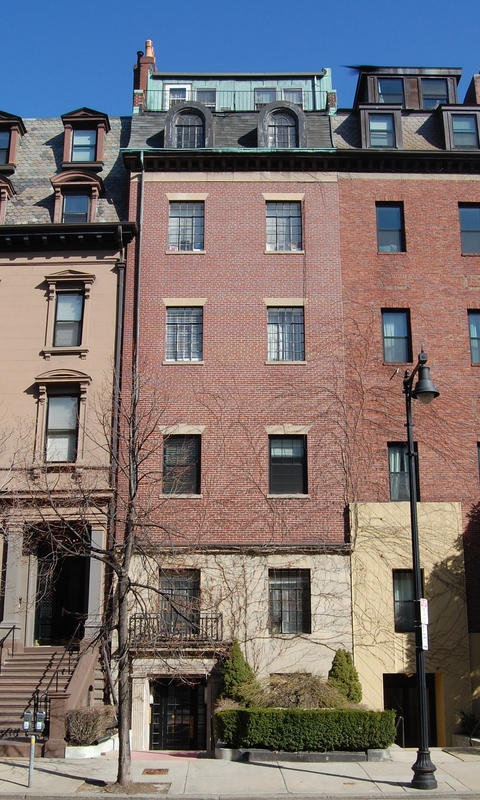 On March 30, 2016, Boucai Properties LLC acquired the Beacon Street Family’s Trust LLC’s interest in 142 Beacon, and on April 1, 2016, the Beacon Street Family Trust LLC acquired Boucai Properties LLC’s interest in 140 Beacon. 142 Beacon remained an apartment building, owned by the Boucai Properties LLC, in 2016.